Like a lot of nutritionally robust foods, oatmeal sometimes gets a bad rap for being boring. Even the sight of plain, cooked oats—often resembling a mushy kind of paste—can have people passing it up in favor of a sugary cereal or pancake stack. But oatmeal can wind up being one of the better breakfast choices, not only in taste, but also in its health benefits, Time reports. It all comes down to what type of oatmeal you buy and how you prepare it. To determine your best oat option, it helps to understand that oatmeal isn’t really oatmeal. When oats are harvested, they’re wrapped in a hard husk that manufacturers remove to facilitate cooking. Inside is the groat, a complete grain full of fiber. When you buy oatmeal that’s labeled “instant,” "quick-cooking," "rolled," or "old-fashioned," the groat has been steamed and rolled flat to make it easier to cook. The mostly unadulterated oatmeal labeled “steel-cut” or “Irish” is actually made up of groats that have been chopped up but are otherwise whole. Typically, the faster you can cook the oatmeal, the more it’s been processed and the less it resembles the groat from the field. Because they resemble kernels and remain thick, steel-cut oatmeal requires the longest preparation, simmering on a stovetop for 30 minutes or so. Processed oats are flaky and can easily be heated. Nutritionally, both rolled and steel-cut oats have the same profile. Both are fibrous and high in vitamins E, B1, and B12. Steel-cut oats have a heartier texture, while instant tends to take on a loose, light consistency. But because steel-cut oatmeal keeps more of the whole grain intact, it tends to be higher in fiber and lower on the glycemic index and provides more of a slow-burn energy as opposed to the quick burst of the sugar found in flavored instant oatmeal packets. 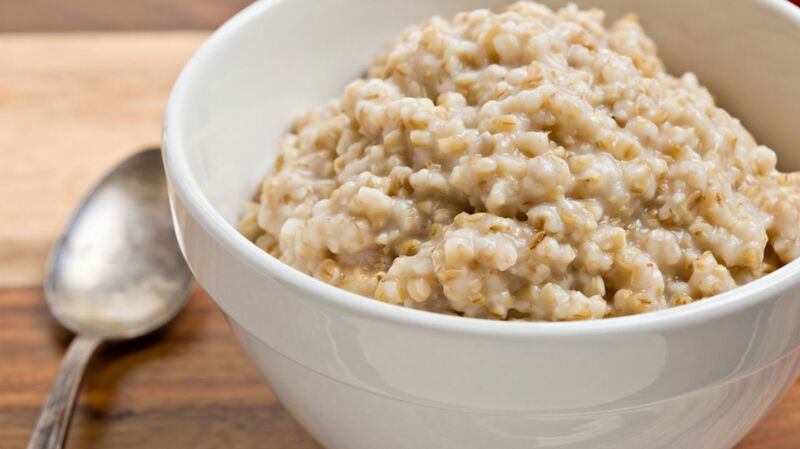 If you want to opt for steel-cut oats but are short on time, there are solutions. You can soak oats overnight to reduce cooking time down to 10 minutes or so on the stove, or prepare a week’s worth so you can quickly re-heat portions. Topped with yogurt, peanut butter, or fruit, it’s one of the best breakfast choices you can make. And with a little foresight, you won’t have to sacrifice your busy morning to enjoy it.